NEW German Military Commando Sweater. Ahh, 100% naturally warm WOOL! Just the ticket to combat Jack Frost attacks. Cinches at base so you don't get "drafted"
Tapering style near base hugs your body. Made in Germany. Order yours ONLINE on the double! 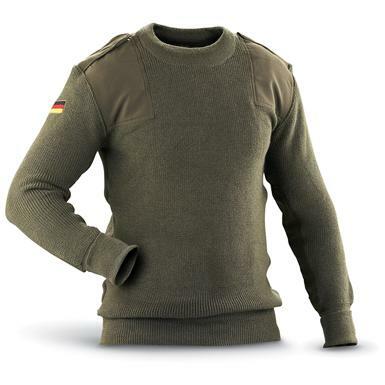 New German Military Commando Sweater, Olive Drab is rated 4.5 out of 5 by 2. Rated 5 out of 5 by shauntherevelator from Awesome Sweater!! I LOVE THIS SWEATER!! I have had this sweater for a little over two weeks now, and I have already put it through the ringer! I have used it hiking in sub zero temps, white out snow storms, and bad wind storms and it has excelled in all conditions. I usually only wear this and a tee shirt underneath and I haven't had any problems yet. This sweater is tighter knit then a British Comando sweater that I also wear so it does stay a little warmer. The one I received is a little different then the one pictured, it has a pocket over the left breast, but this doesn't bother me. I ordered extra large and it fits me a little snug, but very comfortable and not itchy. The tag does say 80% wool 20% poly, but I am pretty sure the poly is just the elbow and shoulder pads. Overall great sweater for the price, highly recommend! Rated 4 out of 5 by Roughrider from Actual item does not match the photo I did not want a sweater with a chest pocket. The photo shows a sweater without a chest pocket. The sweater that I received has a chest pocket. The description states 100% wool, the label says 80% wool, 20% poly. The large would be better labeled extra large. Dress just like a British soldier!